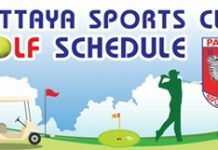 The weather is still a topic of conversation in Pattaya golf circles as we are hopefully winding down the rainy season period for another year. The good news is that the rain is clearing; the bad news is that the green fees are increasing as the high season approaches at the end of the month. Come the 1st of November, your golf just got more expensive. That said, we still get some pretty good deals compared to the rest of the world, and you just can’t beat our Thai caddies for a fun golf experience. I am not a Smurf…Gabe shoots 40. In spite of overcast skies above, we had a good turnout of 24 golfers today and they were rewarded with a nice day with just a short, light shower midway through the round. We had a 3-way tie for third once again, and 35 points seemed to be the magic number for the day. 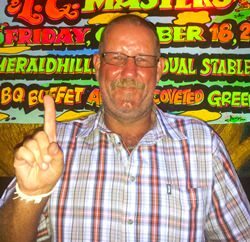 Sole second went to our old pal Jeff Cordeiro whose single digit handicap earned him 36 points on the card. Watch out for Jeff’s buddy Stevie Snelgrove on his way down from Vancouver. Steve likes to get on that podium too! The story of the day, however, was the fantastic 40 point round of Gabriel Enright, our favourite website guru. Gabe is part of the family here at TGC and has been in town for 3 weeks now. As is the usual story, just when you are getting hot, then it is time to head back to the airport to fly back home to Oz. Great shooting Gabe, and see you next time mate. As usual, The Golf Club was proud to host the 20th Annual T.Q. Masters for our buddies down at The Tahitian Queen on Beach Road, just after Mike Shopping Mall. T.Q. is Pattaya’s oldest go-go bar and was established way back in 1978. It is the home of “The Jesters” who are a great bunch of guys that contribute a lot of their own personal time and money with Care 4 Kids and many local charities. 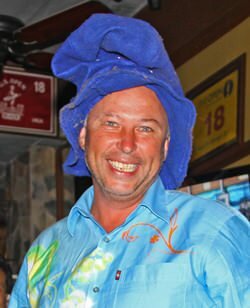 These guys do not get the credit they deserve for all that they do for the underprivileged in Pattaya, so our thanks go out to them and of course to Lewis “Woody” Underwood. Drop in and see them sometime, either afternoon or evening, for a great time! Gavin Wright listened to his caddy and bagged his first hole-in-one at Emerald’s 5th hole. This is a great, fun day of golf and for all the results and the gory details of the competition, see the full story on other pages of this issue. We must take a moment to congratulate Gavin Wright (yes, the same guy that just got married last week!) as Gav scored his first hole-in-one on the 5th. Most of the credit would go to his male caddy (who plays off a 4! ), who insisted Gav use the 8 iron. The ball went in the hole, and a 2,000 baht tip went into the caddy’s pocket. I think that October 2013 is a month that Gavin will remember for the rest of his life. Good on ya Gav! Note: The Golf Club is located on Soi LK Metro. We try to schedule summer “Sports Days”, so come join us for a seriously fun day out. Just call 085 434 3377 or see our website www.golfclubpattaya .com and for more information mail us: pattaya4golf @gmail.com and see updates at www.facebook.com/golfclubpattaya… all handicaps welcome.